At its June analyst meeting, Mitel announced CloudLink, a focal point of its product roadmap and a key element in its ability to absorb future telephony acquisitions. CloudLink is also part of Mitel's IoT-enablement planning, as discussed in the recent No Jitter article, "Giving Machines a Voice." CloudLink as a "Bridge to Cloud"
With technology gained over the years in the Inter-Tel, Aastra, and Toshiba Unified Communications Systems acquisitions, Mitel has a larger variety of call control platforms than any other vendor. One of the company's mantras has been that it does not require end-user customers acquired through acquisition to upgrade to Mitel-branded call control solutions and handsets; rather, customers with any Mitel-branded or Mitel-owned platforms can continue to use the call control engine they currently have, and Mitel will continue to support it. These customers will eventually need to upgrade, and Mitel will be there with new systems and/or cloud-based offerings. CloudLink is a strategic asset because it gives application developers access to the 60 million telephones connected to the many Mitel call control platforms. CloudLink does this by normalizing proprietary call control signaling so that an application built in CloudLink can use nearly any PBX a customer already has in place. Plus, it makes it easy for Mitel to do additional acquisitions while providing an immediate pathway to cloud applications for new customers. CloudLink has two elements: the CloudLink gateway and the Mitel Next Platform that runs in the Amazon cloud. The CloudLink gateway is a physical device, about the size of a small router, that can be deployed on premises, in the cloud as part of Mitel's MiCloud service, or as part of a partner-hosted, Mitel-powered service. Adaptors within the gateway communicate with the underlying call control platform using the PBX's signaling protocol or generic SIP. The Mitel Next Platform provides APIs and development tools for application builders who can create applications programmatically, as well as a new zero-code development environment for non-programmers. The zero-code environment (general availability date has not been announced) provides a drag-and-drop interface and intuitive toolset that allow nearly anyone to create communications workflow applications. I wrote about such an environment in an earlier No Jitter post, "Integrations and Mashups Via the 'Un-API'". Both development mechanisms allow the creation of apps that work with any of the call control engines supported by the CloudLink gateway. The Mitel Next Platform also provides a run-time environment for the applications to execute in. Applications with broad appeal can be multitenant, purchased and run by any Mitel customer, while Mitel or its partners can customize apps for a particular customer, if desired. 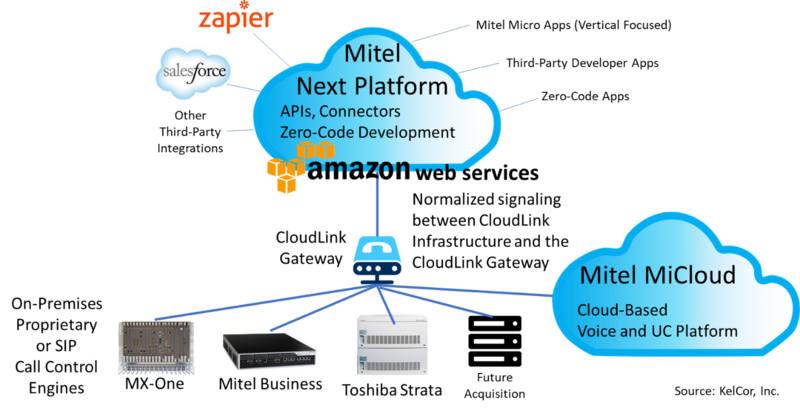 Finally, Mitel Next provides hooks to select third-party cloud-based applications, such as Salesforce and Zapier, for which Mitel has built an interface.